This entry was posted in Campus Announcement and tagged College of Liberal Arts, Theatre on July 29, 2014 by Wire Eagle. AUBURN UNIVERSITY – A black box experimental theatre and a 1,500-sq.-ft. dance studio are part of a newly constructed addition designed to enhance the experience of audiences and performers at Auburn University’s Telfair B. Peet Theatre. The $3.9 million project is a two-story, 10,471-sq.-ft. addition to the existing theatre, featuring a production space that will accommodate up to 150 patrons and a dance studio that can double as an event space. The addition will expand production possibilities for Auburn’s theatre, music and dance programs and provide the latest technology, training and education for students. 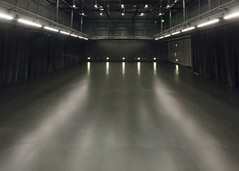 A black box theatre is just that – a square performance space with black walls and a flat floor, which allows for flexibility in the ways the area is used for different kinds of performances. The addition boasts a completely digital lighting control system, engineered sprung flooring in both the theatre and studio and a wire tension grid which allows safe access to lighting, cables, speakers and effects. The grid is the first of its kind at a university in the state of Alabama and will safely hold up to 90,000 lbs. The new space also includes additional lobby and office space and a drop-off drive for patrons of music and theatre events, as well as dressing rooms for productions in the black box theatre.